“Do you speak Hindi?” a bony, middle-aged man asked, with excitement on seeing Indians among the many foreigners as we arrived at the campsite. He was delighted to know that many of us spoke the same language as him. He called some other young boys to help us pitch our tents and bring us some evening tea. For the next five days, he guided us through the Himalayas and helped us every step of the way. 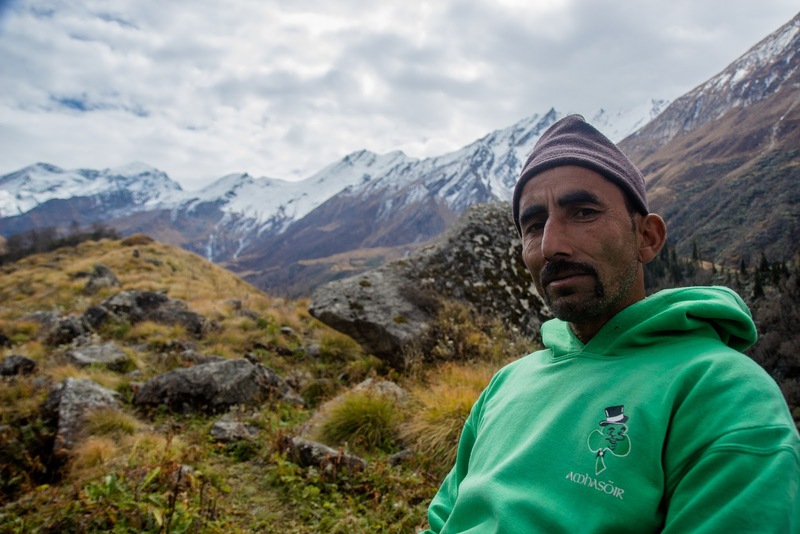 While hiking up the tedious mountains, whenever we stopped and doubted ourselves, he said, “Shabash, let’s go,” giving us the push we needed. Along the way, I discovered many facts about Ganga-ji’s childhood and adult life. “I never liked school. Back then, childhood was harder than it is today. My parents were very strict and they never let me miss school, so I used to lie to my parents. My friends and I used to bunk school and play. Then in the evening, when the kids started coming back to the village, I used to go back home too,” he said while grinning. Much like him, he finds his kids to be quirky and hard to deal with at times. However, he said that the one thing he wants more than anything is to see his kids build a life for themselves. “I never want to force my kids to do anything. I want them to learn from their mistakes, and become good people,” he said. Whilst he emphasizes the importance of giving his kids freedom, he also thinks that it is very important for kids to take education seriously. He regrets not being serious about school as a child. “I had an opportunity that not many people got in those days, but I wasted it,” he said. Although he has two kids of his own, both of whom study near Dehradun, he feels that all the young people who visit Ruinsara Tal are his children, and that has a special place in his heart for all of them. Ganga-ji’s father was also a farmer, but now he is too old to work. Because his mother passed away a few years ago, he wanted to take care of his father, not wanting to leave him alone. He considers it his duty to take care of his father because if he does not, his children will not take care of him when he needs them. Throughout his career as a guide, he has led many hikes, four of which have included Woodstock staff and students. “I love Woodstock students, and I wish to come and visit you all someday,” he said. Ganga-ji is also a man with very strong beliefs. He believes that money is temporary, and the only permanent thing in a man’s life is love. “Kids look for luxury these days. They want all kinds of things. But what they don’t understand is that things don’t stay with you forever,” he said. He is also a firm believer in destiny. He believes that everything happens for a reason, and that everyone’s fate is decided by God. Leaving the lush greenery of the mountains and the serenity of the valley with the beauty of it captured within our memories forever, but here we met a man who not only taught us how lucky were we to have our loved ones and for being able to witness this beautiful place but also taught us that happiness is just a state of mind: it isn’t governed by any external factors, it is only decided by the internal ones. And if there was one thing I wish all my friends took away from this hike, it was this very idea.